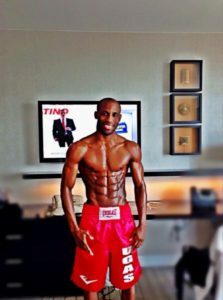 PBC on FS1 Results: Cuban Ugas stopped Lara at Tunica! Cuban Ugas stopped Lara at Tunica! FS-1 Premier Boxing Champions promoted at the Fitz Casino & Hotel in Tunica, MS, Tuesday night. In the main event Cuban Yordenis Ugas, 19-3 (9), out of Las Vegas, stopped Nicaraguan Nelson Lara, 17-8 (7), out of Costa Rica at 0:29 of the second round on a bad cut.. In the opening round Ugas was landing right hands to the body of the much shorter Lara. Lara answered with wide punches mostly missing. In the second round Ugas landed a right uppercut opening a bad cut over the left eye of Lara followed by a straight right to the head dropping him. Referee Bill Clancy called in the ring physician but made the final decision himself stopping the fight. In a co-feature welterweight match Mexican 2012 Olympian Oscar Molina, 13-2-1 (10), out of Norwalk, CA, was soundly beaten by Levan “The Wolf” Ghvamichava, of Poti, GA, over 10 rounds. In the opening round Molina who was moving down from super welterweight to welterweight used an effective jab while moving to his left having Ghvamichava following him and not cutting off the ring. In round two Ghvamichava who was moving up from super lightweight started showing his power going to the body of Molina while having his hands high giving Molina little offense to get through to his chin. In the third round Molina was using his jab but Ghvamichava is still going to the body very well. In the fourth round Ghvamichava took control while Molina stayed in the middle of the ring instead of moving and he paid the price. With 10 seconds to go in the round Molina landed his best punch up until then an overhand right to the head of Ghvamichava who countered with his own right to the head. In the fifth round Molina was back to using his jab but Ghvamichava was using double jabs to the body followed by rights to the head of Molina. In the sixth round Ghvamichava dropped Molina with a short right to the head down to a knee. The referee called it a slip. In the seventh round it seemed like the best round of the fight. Molina was landing good left hooks but one at a time. In the eighth round Ghvamichava was waking right through Molina’s jab landing with both hands to the body and head of Molina. In the ninth round Molina continued using the one punch left hook instead of using combinations. He landed a lead right to the head of Ghvamichava getting his attention. In the tenth and final round Molina was desperate knowing he was behind throwing wild punches with most only hitting air. Ghvamichava continued what he was doing since the second round coming forward taking it to Molina with double left hooks to the body and rights to the head. The judges had it 98-92 twice and 97-93 as did this writer have it 97-93.